A special device if you are working with a global team. It is a better way to compare times in various zones at a glance. Its a set of wall clocks nicely creating a beautiful display and showing world time that relevant to your business. 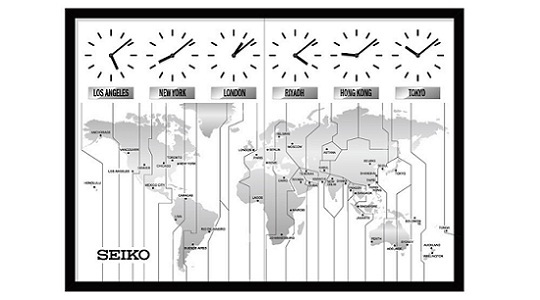 It dresses up any office with six clocks for different time zones with 5 pre-printed plaques for your convenience. Seiko name has become synonymous with cutting edge technology and high precision. Its the first kinetic, kinetic chronograph, kinetic auto relay, kinetic perpetual and kinetic direct drive technology.